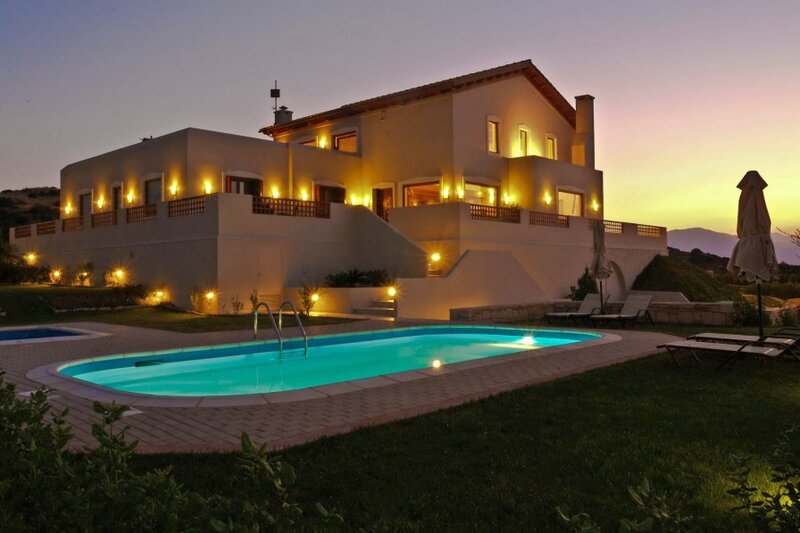 This 6-bedroom villa for up to 12 guests is located in Archanes and has a private swimming pool. Large, beautiful, comfortable villa Country Luxury Villa, built in 2008, renovated in 2015. In the district of Houdetsi 9.7 km from the centre of Archanes, in a secluded, quiet, sunny position on top of a hill, 21 km from the sea. Private: large garden with flowers and trees, lawn for sunbathing, swimming pool (40 m2, 01.04.-30.09. pool opening hours: ). Volleyball, barbecue, parking (for 5 cars) at the house. Grocery 1.7 km, supermarket 1.7 km, restaurant 1.7 km, bakery 1.7 km, cafe 1.7 km, sandy beach Karteros 21 km. Nearby attractions: Labyrinth Musical Workshop 1.9 km, Archaeological Museum of Archanes 11 km, Folklore Museum of Archanes 11 km. Please note: car recommended. Suitable for families. Groups of teenagers on request only. Suitable for events.